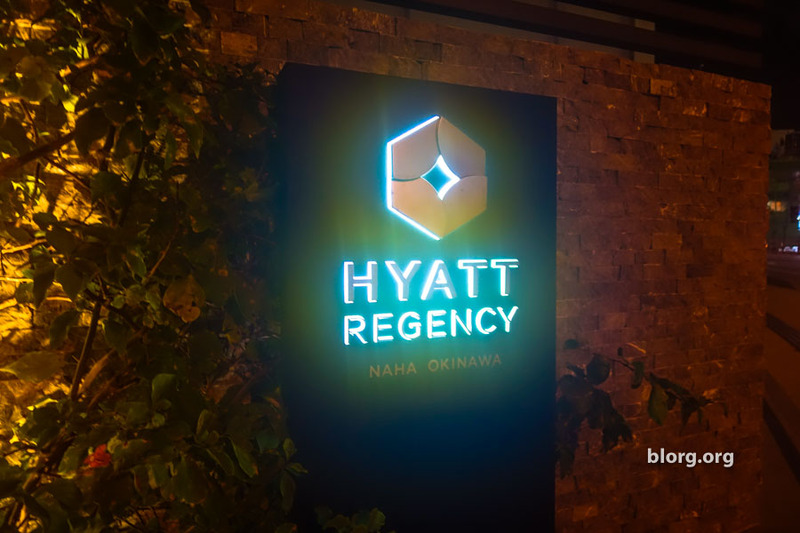 Staying at the Hyatt Regency Naha using 6k hotel points and $75USD per night. This was a great option due to the location and redemption value. At a Category 3 Hyatt, that’s 6000 World Of Hyatt points + $75USD per night. The cash rate for the hotel was about $300/night which makes using points a no brainer. You could also value the cost of this stay to be about $140/night, but after looking at the hotel prices in Naha I knew I wasn’t going to get a better deal. With my rental car, I drove right to the front of the hotel and was hit with a warm welcome. They helped take my luggage out of the car and walked me to the front desk. They were about the valet park the car but I asked them to keep it out front since I’d be going to return the car soon. Checking in went smoothly, they upgraded me from a standard room (what you get on points) to a Deluxe room for being a platinum member. I’m only a platinum member because I have the Chase Hyatt credit card. They told me they received an envelope addressed to me (I ordered a JR pass) and would bring it up to my room with the luggage. The room had two beds. I asked for a room with only one bed at the front desk but they told me all rooms have two beds. Hmm, I guess that makes more sense since they can accommodate more people. They offered to push the beds together so I could have one SUPER BED. With a calm and cool demeanor, I accepted this offer. I really like the this Hyatt had laundry machines that you could use yourself. I NEVER pay for laundry service at hotels that charge a “per item” rate. If they didn’t have one, I was going to find a laundromat somewhere in the city. The laundry machine was really cool! It was one large unit that WASHED and DRIED your clothes. At a cost of 500JPY for a 3kg load. You can add more than 3kg but your clothes probably won’t dry as quickly. This was convenient since you wouldn’t have to go back to the machine to move your clothes from the washer to the dryer. Although, it did take 2-3 hours for this to finish. They had one of these laundry machines on almost every even floor of the hotel. It’s hot and humid in Okinawa so the pool is always a good option. The pool is located several floors up from the ground so you get a nice city view as you swim around. The absolutely best thing about staying at this hotel was the location. There is an immense amount of places to eat around this hotel. I didn’t eat at any of the restaurants in the hotel since all the really good places were outside. The hotel is located at a 5-10 minute walk from the city’s only tram and a 2-minute walk from the Kokusai Dori, the main street where you can find all the restaurants and places to shop! I would have hung out here a week just to eat.